On the eve of the Rio 2016 Olympic Games, the London Olympic gold medalist Zhao Chang-ning of Kazakhstan was found to have used banned substances and deemed in violation by the international weightlifting review committee. Hsu Shu-ching, the runner-up, was announced as the first female gold medalist in the history of Taiwan. In the same year, she won the gold medal at the Rio Olympics. She became the first Olympic two-time gold medal winner in the history of Taiwan’s Olympic team and achieved many new records. The Artificer team was very fortunate to have had the opportunity to visit with Taiwan’s weightlifting god-father—coach Tsai Wen-yi. Coach Tsai is both strict and very protective of his athletes. So, when we first met coach Tsai he was very suspicious and used extreme methods to test our sincerity. After several exchanges and careful evaluation of our technology for use in athletics, we finally got the coach’s approval and support and was able to get to know Shu-ching better which led to our cooperation. During filming coach Tsai let out a very happy smile, a vast contrast to his usual strict demeanor. Ever since our first meeting until now, Shu-ching has always been a very practical and down to earth girl. She’s never let her achievements change her in anyway and pours herself into her training every single day. Her hands have accumulated unimaginable thick callouses and her clavicle due to the long-term stresses it had to bear has slowly deformed. Through it all she has never once complained. Instead, she tells us how hard everyone around her has been working and how much support they have given her, hence her need to continue to work hard. The steady and calm expression during competition is the one that most people associate with Shu-ching. However, away from the stadium and competition, Shu-ching is very courteous and sweet, always with a smile on her face. Every time we head south to Kaohsiung to visit. No matter how late it gets, she will always send a text to us to express her gratitude and thanks; “hard work today! Let’s continue to work hard together” or “thank you for today” etc. Always letting us feel her warmth. Whether it was for filming her short introduction video or the photo shoot at the end of 2017. Shu-ching always took time from her rigorous training schedule to cooperate. Through it all, she maintained her full faced smile and professionalism. Afterwards, continuously thanking the photo/video crews and team. This sincerity towards others given her age and achievements is something that our entire team truly admires about her. Over the years, with increasing age and the challenge of sports injuries, Shu-ching is still doing the same thing day after day. 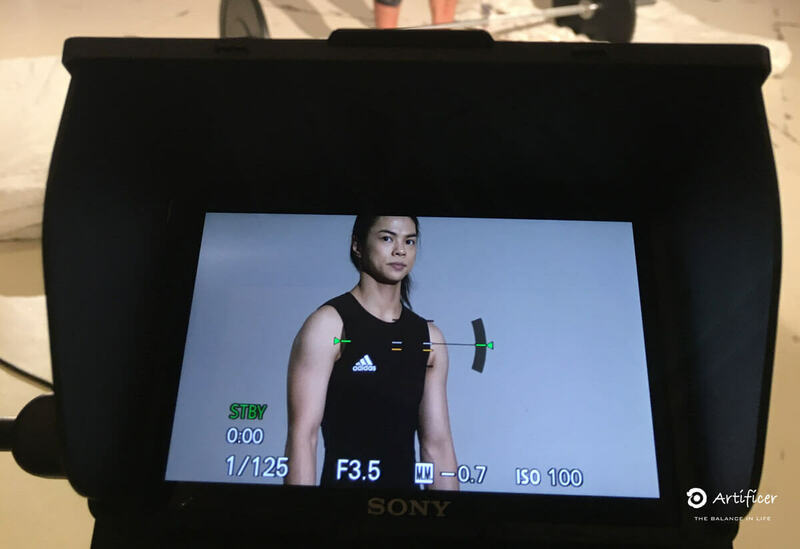 However, in June 2018, Shu-ching released a statement on her fan page announcing that her career as a competing weightlifter has come to an end. She will enter into the next stage of her career. Upon seeing this message, countless people replied and commented by thanking her for all of her hard work and dedication she has brought to the sport. Of course, we will always remember her spectacular highs and all the glorious results. For Artificer, we are so very grateful to Shu-ching for her belief in this small brand, and for over five years allowing us the opportunity to accompany her in training, awards and retirement. Our time spent together has taught our Artificer team members that determination in just one thing—even if the journey is monotonous and boring at times—that perseverance till the end will bring unexpected results. To be able to find someone that exemplifies the meaning and spirit of the word Artificer, and to be able to work so closely together has been our greatest honor. This entry was posted in Latest, Brand. Bookmark the permalink. Suffering from Poor Sleep Quality? Use the Bracelet to Help You Find the Problem and Improve It!